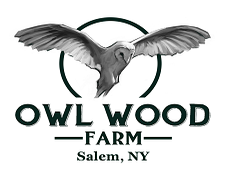 Owl Wood Farm is a small scale intensive operation producing a wide variety of vegetables, herbs and strawberries. We are certified Naturally Grown and use no synthetic herbicides, pesticides, fertilizers or GMO seeds. We do all the field prep, seeding, weeding and harvesting by hand. You can find our produce at farmers' markets and the Cambridge Co-op.